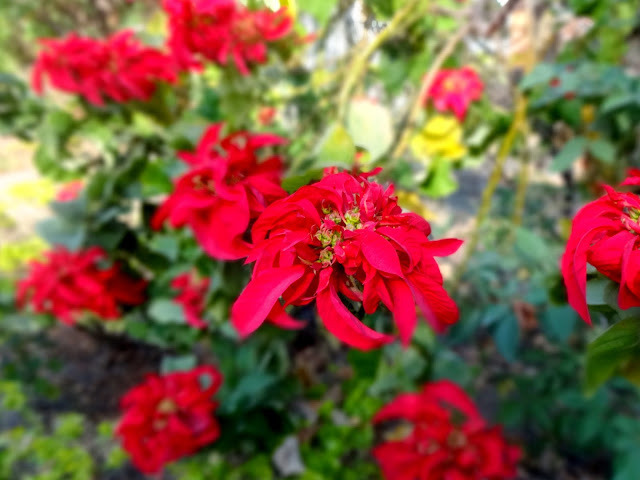 It is the last day of the year. There is something special about the day. A kind of peace pervades all around. Nature is calm, the Sun is mild. We are sitting on the mats spread on the grassy patch of the courtyard. Fireball is blooming in all glory. Very soon the Sun shall set and the year 2017 shall pass into the annals of history. We will all go to the terrace to watch the last sunset of the year. This is a ritual we have been following since olden times. As children, we would all got to the terrace to watch the last sunset of the year. We would stay there until twilight. Then, a bonfire would be lit followed by songs, dance and some reflections on the year that was and in the end, loads of good food. The festive spirit is soaking in as the day progresses. A bundle of wood that has been drying in the Sun will be used tonight. Our home is smelling heavenly as a Panforte has been baked for the occasion. 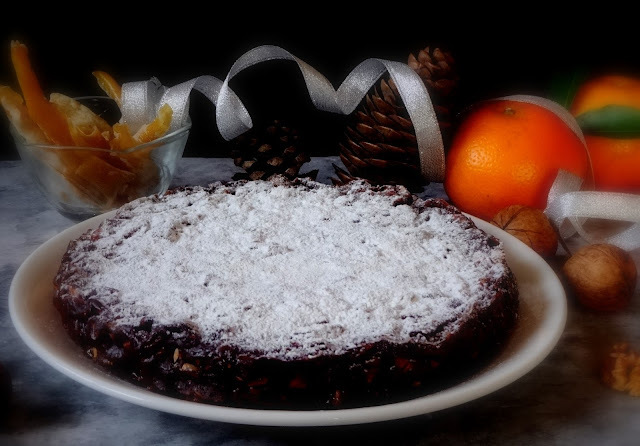 Panforte or Panforte Di Siena is a Christmas fruitcake from Siena Italy. 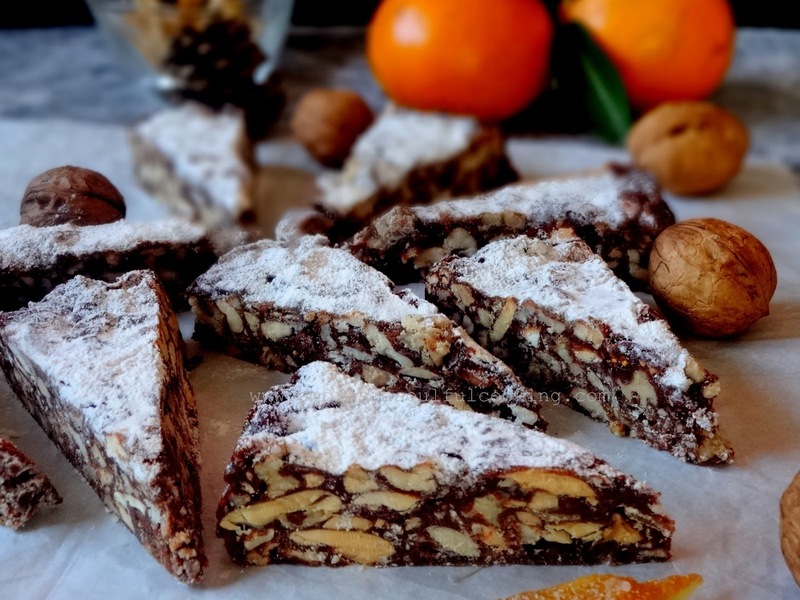 Panforte is hard, chewy and full of nuts and spices and very little flour with boiled syrup made from sugar and honey to bind the ingredients. Some melted chocolate also goes into it. 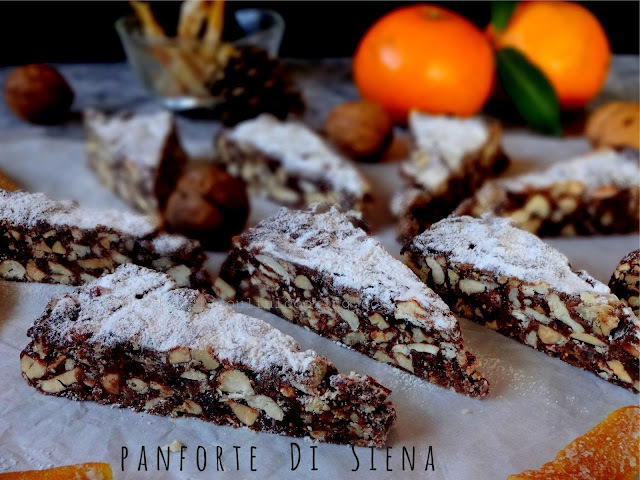 Panforte is more like a candy and is very addictive. Take almonds on a baking tray. Set oven temperature to 150 degrees. Toast almonds for 10 minutes or until lightly brown and fragrant. Chop coarsely. Chop candied peels and figs. Preheat oven to 150 degrees C. Line the bottom of one 9 inch springform pan with parchment paper. Grease the sides generously. In a large bowl, take flour, spices, cocoa powder, and salt. Whisk well. Add chopped nuts, peels and figs. Break chocolate into small pieces. Melt the chocolate in a steel pan placed over a saucepan of boiling water. Pour melted chocolate over the mixture. Stir to combine. Take honey and sugar in a thick bottom pan. Place the pan over medium heat. Stir until sugar dissolves. Now bring it to a boil. Keep swirling the pan. Do not stir. Insert a candy thermometer and cook till the temperature reads 115 degrees C.
If you do not have a candy thermometer, then cook the mixture for about 2 minutes only (after it comes to a rolling boil). If you cook beyond 2 minutes, it will become hard after cooling and will make panforte really hard. Pour this boiling syrup over the mixture. Stir well (you will have to hurry up here as it will begin to harden). Spoon this batter into the prepared pan. Level the top with the back of a spoon or wet your hands and level the top. Bake in the preheated oven for 20-25 minutes. Or when see you the bubbles in the edges, it is done. Remove from the oven. Keep the pan on the wire rack to cool. When it cools down but is still warm, loosen the edges with a spatula. Remove the sides. Dust the top with icing sugar. When Panforte cools completely, remove from the plate and peel off the parchment paper. Wow Namita! It looks so tempting.. totally new for me. Hello Binu, A very Happy New Year to you and family. 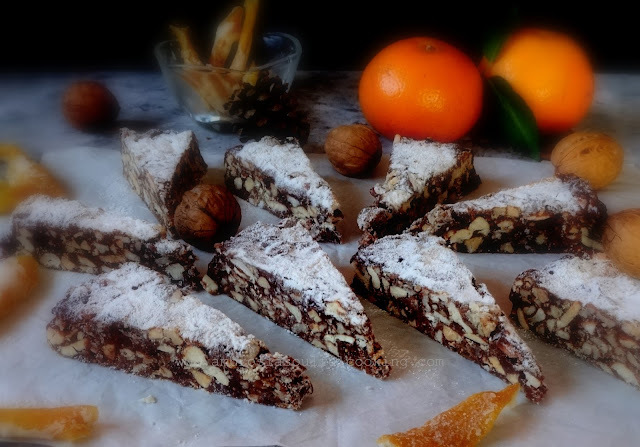 Panforte is delicious and healthy. I am sure you'll ove it! am an ardent fan of your Blog - just love what you make, your stories, the warmth and love in what your write, make and click.. I miss getting your updates..
Hello Pratibha, Thank You for your love. You made my day! My blog has become a .com. Perhaps some settings need to be changed. I was not aware of this. Thank You for bringing it to my notice. I shall try to fix this. Happy New Year to you and family! Totally new to this dish but those slices look so rich and heavenly. Getting the consistency of the syrup right is the key to this recipe I guess! Hello Ria, you are absolutely right. If you overcook the syrup, it becomes really hard on setting. If you do not have a candy thermometer, it is better to undercook the syrup. It will make a very delicious and chewy Panforte.